To Vaccinate or Not to Vaccinate?…that is the question! If you have children, are planning to have children, are currently pregnant, or know other sisters who fit any of the afore mentioned criteria, please read this, comment, and spread the knowledge. History does not have to repeat itself! Know the facts and give yourself the right to choose! Recently I got into an online discussion about vaccines (which prompted me to write this post). Two people in particular where adamant vaccines were 100% safe, and that anyone who disagreed was an ignorant quack. They went on to quote what they called “facts” (that were flat out untrue) but they were adamant they were right. But it fell on deaf ears. On and on the discussion went, back and forth, until I had to leave for a family outing – feeling mentally drained and wondering whether anything I’d said made any difference at all. Despite the above statement, no recall of the vaccines containing mercury was ever issued and companies continued to sell lots already manufactured with expiration dates as late as 2007. It is plausible then that vaccines containing large amounts of thermerosal were still being administered to children as recently as 2007. The removal of thimerosal in vaccines has been more of a gradual phasing out, than a sudden halt. A person must not recieve more than 0.1mcg of mercury, per kg of body weight per day. An average 6kg 6 month old infant must not exceed 0.6mcg in a single day. 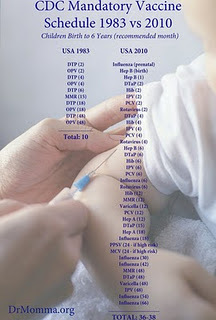 Yet as seen in the table above, many vaccinations shots contain 42 times this amount. What compounds the problem is that in other documents the CDC recommends children receive up to 9 vaccination shots at one doctors visit. It’s entirely possible that a child will receive the DTwP and Influenza both at the same doctors visit, where the child will recieve 50 mcg at once, exceeding the mercury toxicity threshold 83 times. Many of these shots also need up to 5 repeated shots every couple of months, so the child will continue to receive toxic doses of mercury at regular intervals throughout the year. Whether a person will display symptoms of mercury toxicity depends on the person’s individual physical ability to process it – some people can not process mercury at all and will react severely and immediately, others will take days, weeks or years. Any amount of mercury is toxic and is extremely difficult to remove from the body without chelation therapy. Symptoms of toxicity depend on the amount injected and the person’s ability to process it – but it will cause toxicity make no mistake, it may just be more gradual in some. So no, the amount of mercury in the above current vaccines is not safe. The removal of thimerosal from vaccines has been a gradual phasing out, not a sudden halt. And it is still in 6 different types of vaccines, in no way has it been entirely “removed”. Vaccine caused autism would match a gradual decline seen in statistics below. • Older children with autism are continuing to be identified. • It takes from 2 to 7 years or longer for older children who have autism to be identified. • Children under three years of age lag in being diagnosed. • Prevalence for each birth year will continue to rise until all persons in that birth year are identified. The problem is current charts often show a continued increase in overall autism rates, which on the surface is misleading. It makes it seem as if each year the number of babies born with autism is sky rocketing. When in fact it is the older children who are only now being diagnosed with autism who are making up the bulk of the current statistics. My question is what happened to children born between 1998-2003 that triggered a massive increase in autism cases? In a report authored by the CDC in June 2000 it was concluded exposure to more than 62.5 micrograms of mercury within the first three months of life significantly increased a child’s risk of developing autism. Specifically, the study found a 2.48 times increased risk of autism. These disorders included developmental disorders, specific delays, developmental speech disorder, autism, stuttering and attention deficit disorder. As a consequence of this study major health organizations issued a joint statement recommending the removal of thimerosal as soon as possible. And while many vaccine manufacturers complied, as shown in the above table many still contain amounts that if taken together at the single doctors visit would be far too close for comfort to the 62.5 mcg of mercury mentioned in the CDC’s study. But even if mercury containing vaccines are not taken together, the amount would still be damaging, maybe half as bad, and I’m sorry I don’t want ANY ‘neurological development disorder’ affecting my child for the sake of a vaccine – it is not a viable tradeoff. Had elevated levels of androgens. Excreted significant amounts of mercury post chelation challenge. Had biochemical evidence of decreased function in their glutathione pathways. Had no known significant mercury exposure except from Thimerosal-containing vaccines/Rho(D)-immune globulin preparations. Had alternate causes for their regressive Autism Spectrum Disorders ruled out. Had a significant dose-response relationship between the severity of the regressive Autism Spectrum Disorder and the total mercury dose children received from Thimerosal-containing vaccines/Rho (D)-immune globulin preparations. Were exposed to significant amounts of mercury from Thimerosal-containing biologic/vaccine preparations during their fetal/infant developmental periods, and subsequently, between 12 and 24 mo of age. Were previously normally developing children prior to mercury exposure. To that I replied, “ALL studies and publications twist facts. Yes that’s right, every single study is funded by someone, and each person has their own personal point of view, their own bias.” Again this was brushed off. It’s an illusion that because a study was conducted by a “scientist” the contents of are of pure truth. We can never be sure a study was accurately conducted, but often it’s all we have to go on. And the stats themselves can be interpreted literally any way you like, the way in which it’s delivered to you will sway you in whatever direction the commentator wants you to go. – The study specifically eliminated any children with autism or a neurological condition. Children who had had encephalitis and meningitis were also eliminated. This literally makes the study null and void. And I’m quite dumbfounded every time I read it. They removed any child that would conflict with the outcome they wanted: to show thimersoal does not cause neuropsychological deficits. What a novel way to deal with the problem, just remove the evidence and continue as it you’re conducting a valid study. If the study were conducted honestly these would have been the children they were specifically looking for, they were what the whole study was supposed to be about. – The authors went on to eliminate 70% of the study participants. The authors themselves also acknowledge that selection bias might have been a factor in the findings. It really sounds more like it was an audition to find the healthiest children, than a valid, randomized group of study subjects. – The primary concern about thimerosal, that it causes autism, was not addressed or included in the study. The study noted that autism itself – the condition most often connected with thimerosal – was not considered. – The authors of the study had major conflicts of interest. Serves on the scientific advisory board of Merck (major vaccine manufacturer). Holds a patent on the RotaTeq vaccine produced by Merck. The lead investigator, is a former employee of Merck. Has received consulting fees from Merck, Sanofi Pasteur, GlaxoSmithKline, and MedImmune. Received grant money from Wyeth, Sanofi Pasteur, GlaxoSmithKline, and Novartis. He received lecture fees from Sanofi Pasteur and consulting fees from Wyeth and Abbott. Currently, he is a consultant to the FDA Vaccines and Related Biological Products Advisory Committee. Is a consultant to the CDC Advisory Committee on Immunication Practices. Receives consulting fees from MedImmune, GlaxoSmithKline, Novartis, and Merck, and grant support from MedImmune, GlaxoSmithKline, Aventis, Merck, and Novartis. Dr. Davis – Receives consulting fees from Merck and grant support from Merck and GlaxoSmithKline. As you can see you’ve got to be very careful which studies you tout as evidence. In another paper, published in the journal Psychological Medicine in 2006, Researchers found that in studies on psychiatric drugs favorable outcomes were significantly more common in studies sponsored by the drug manufacturer (78%) than in studies without industry sponsorship (48%) or sponsored by a competitor (28%). These are just three of many, many papers on conflict of interest within the pharmaceutical industry and the reporting of drug trial results. Such conflict of interest is so widespread and has become such a significant problem that is has begun to be addressed by the major peer-reviewed medical journals. Many medical journals have initiated stricter ethics codes for publishing research funded by pharmaceutical or medical device-makers, including many journals that have instituted zero-tolerance policies for study authors with financial ties to drug companies. However, this doesn’t avoid the problem of many studies that produce negative results never being published at all. Added to this is the use of spin to convince readers of a more favorable result. In a 2009 report, Dr Isabelle Boutron said that more than 40% of studies with negative findings were “spun” and even in trials with favorable outcomes, 49% of phrases considered to be positive “spin” weren’t accompanied by any mention of a statistically significant result. Another problem can be the mismatch between what is reported in the media from a study, or even between an abstract and the rest of the paper. If possible don’t just rely on reading an abstract as they can mislead and conclusions drawn may not match the actual results of research. For example, in a 1998 study of the efficacy of the hepatitis B vaccine in Gambia, the researchers found that, 14 years after administration of the vaccine 37.4% of participants in the study in had been infected, and of the uninfected, 36% had undetectable levels of antibodies.6 In total, 61% of the adolescents and young adults had no immunity to hepatitis B only 14 years following vaccination. Incomprehensibly, the authors concluded in the paper and the abstract of the paper that vaccine efficacy was remarkably well maintained. Only by reading the full paper was it clear that the vaccine had a very low efficacy. No refusal to publish here, just conclusions that are diametrically opposed to the facts. 1. Choudhry, N.K., Stelfox, H.T., Detsky, A.S., 2002: Relationships Between Authors of Clinical Practice Guidelines and the Pharmaceutical Industry, JAMA, 287: 612-617. 2. No Author Listed, 2002: Just how tainted has medicine become? Editorial The Lancet, 359, 9313. 4. Tungaraza, T, and Poole, R., 2007: Influence of drug company authorship and sponsorship on drug trial outcomes, The British Journal of Psychiatry (2007) 191: 82-83. 5. Boutron I, et al, 2009: Spin’ in reports of randomized controlled trials with nonstatistically significant primary outcomes, International Congress on Peer Review and Biomedical Publication. 6. Whittle, H., Jaffar, S., Wansbrough, M. Mendy, M., Dumpis, U., Collinson, A., Hall, A., 2002: Observational study of vaccine efficacy 14 years after trial of hepatitis B vaccination in Gambian children, BMJ, 325: 569. I hope this info has answered some of the questions that linger around in vaccination debates. I know there’s plenty more questions, so I’ll continue researching. Do you have any thoughts or perceptions about breastfeeding and extended breastfeeding? Please read this post from Natural Mama, a beautiful and informative blog from New Zealand. Please comment below! How many times have you heard this: if they’re old enough to ASK to nurse, they’re too old to nurse. As logically barren as this statement might be, I see it tossed around A LOT. When I saw it brought up in a Peaceful Parenting thread on Facebook I was so proud to read the responses from mothers nursing their toddlers, so I thought I’d collate some of best ones below. Really? Why? What makes you say that? How do you know? Says who? Do you mean if you can ask for it, you can’t have it? ‘It’ meaning love, nutrition, comfort, nurturing, food, drink? When my child can ask for broccoli by name, should I stop feeding it to him? And if he is old enough to tell me he needs a diaper change I shouldn’t do it? Did you stop feeding your child when they were old enough to ask for food? You’re old enough to ask your waitress for food, should she not bring it to you then? Just because we can communicate that we want something doesn’t mean we don’t deserve to have it. Children have been asking to nurse since they were born! Language isn’t always just spoken. Children started asking at birth with the rooting reflex. The only difference now is that they use words. In my family, children are to be seen, heard and believed. I know my child is done when he stops asking for it. Meeting my child’s needs now means that he won’t have childish needs as an adult. If you baby the baby, you don’t have to baby the adult. And lastly, thanks for your concern. I will give it all the consideration it deserves. The biological weaning age of humans is 2.5 to 7 years of age. Children weaned before two years of age are at increased risk of illness. Nursing toddlers have fewer illnesses and illnesses of shorter duration. Breast milk continues to provide substantial amounts of key nutrients well beyond the first year of life, especially protein, fat, and most vitamins. Antibodies are abundant in human milk throughout lactation, and increase during the 2nd year. Breastfeeding perks up children and energizes them; it soothes the frustrations, bumps and bruises, and daily stresses of early childhood. Nursing past infancy helps little ones make a gradual transition to childhood. The WHO recommends breastfeeding for 2 years and beyond. It is recommended to breastfeed beyond 1 year and for as long as mutually desired by mother and child. There is no upper limit to the duration of breastfeeding. Increased duration of breastfeeding has significant health and developmental benefits for the child and the mother. There is no evidence of psychologic or developmental harm from breastfeeding into the third year of life or longer. The longer a mother breastfeeds, the lower her risk of breast cancer, ovarian cancer, uterine cancer and endometrial cancer, osteoporosis, rheumatoid arthritis, and diabetes. There is no evidence that nursing past infancy interferes with a child’s appetite for other foods. How do I respond to and avoid criticism about breastfeeding?